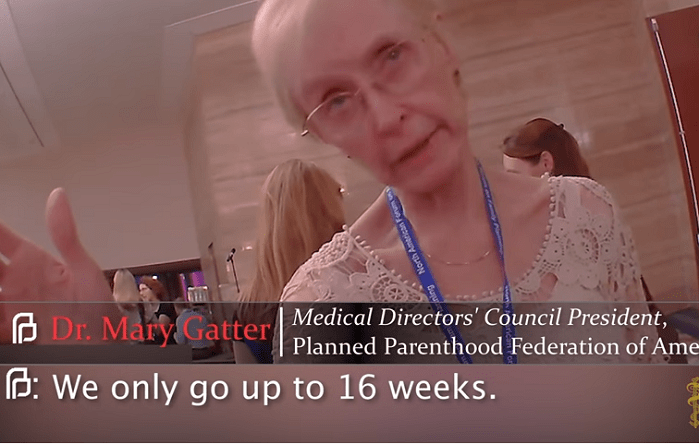 Mary Gatter, the Planned Parenthood senior executive who infamously was caught on tape saying “I want a Lamborghini” while discussing and arranging the sale of body parts of aborted babies has been caught again. As LifeNews reported in 2015, Mary Gatter, the Medical director at Planned Parenthood Pasadena and San Gabriel Valley in California, was caught selling aborted baby body parts to undercover investigators posing as officials with a biotech company that acts as a middleman to sell aborted baby body parts to universities and other places that conduct such research. In the prior video, Gatter discusses the pricing of aborted baby body parts — telling the biotech company officials that the prices for such things as a baby’s liver, head or heart are negotiable. She also tells the officials that she could talk with the Planned Parenthood abortion practitioners to potentially alter the abortion procedure to kill the baby in a way that would best preserve those body parts after the unborn child is killed in the abortion. In this new video, Gatter is again caught haggling over per-specimen pricing for livers, lungs, and brains, even while insisting the purchaser must do all the work to harvest. The video is the second of a never-before-seen batch of undercover footage being released by The Center for Medical Progress. At a Planned Parenthood conference evening reception, CMP investigators posing as buyers from a biotech company are introduced to Dr. Gatter for the first time by Dr. Deborah Nucatola, Planned Parenthood Federation of America’s Senior Director of Medical Services. “I wanted you to meet Mary Gatter,” says Dr. Nucatola, before Dr. Gatter steps forward. Gatter was for many years the Medical Director of Planned Parenthood Los Angeles, before moving to the same position at the Pasadena affiliate, and then being elected President of Planned Parenthood Federation of America’s Medical Directors’ Council. As Medical Director at PPLA, Gatter oversaw the affiliate’s partnership with Novogenix Laboratories, LLC, a local for-profit fetal organ and tissue harvesting company. Federal law permits reimbursement for specified costs in a fetal organ or tissue donation, but prohibits the purchase and sale of the organs and tissues themselves (42 U.S.C. 289g-2). According to contracts and invoices, the real-life fetal organ and tissue wholesaler companies Novogenix, StemExpress, and Advanced Bioscience Resources all made monthly payments to Planned Parenthood based on the number of resalable fetal specimens the wholesalers’ workers could harvest inside the abortion clinics. Planned Parenthood told Congressional investigators it kept no contemporaneous records of actual costs for reimbursement under the law. The Novogenix contract promises Planned Parenthood Los Angeles $45 “per donated specimen.” Planned Parenthood Los Angeles does over 15,000 abortions every year, but has never publicly admitted how much money they received total under their contract with Novogenix. In December 2016, the Senate Judiciary Committee and the House Select Investigative Panel both referred Planned Parenthood Los Angeles and Novogenix to the FBI and U.S. Department of Justice for further investigation and criminal prosecution.